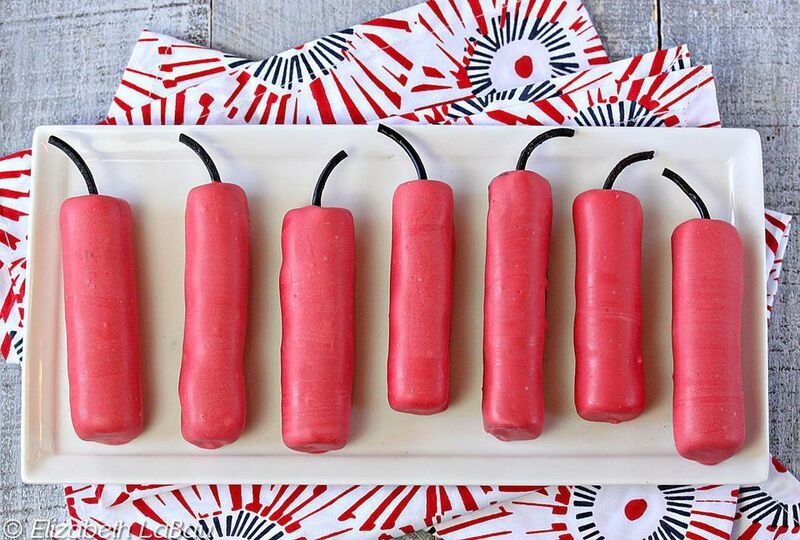 These chocolate firecrackers for the Fourth of July are a blast! They start with an easy chocolate fudge recipe, rolled into cylinders, then dipped in red candy coating. A black licorice "wick" completes the resemblance to fireworks. Feel free to add your favorite nuts or other mix-ins to the fudge! Combine the chocolate chips and the unsweetened chocolate in a large microwave-safe bowl. Microwave the chocolates in 30-second increments until melted, stirring after every 30 seconds to prevent overheating. Once the chocolate is melted, add the marshmallow cream, the water, and the vanilla extract, and stir until everything is well-mixed and the streaks of marshmallow cream disappear. Scrape the fudge into an 8x8 pan lined with waxed paper or foil, and press it into an even layer. Press a layer of cling wrap on top. Refrigerate it until it is firm enough to cut, about 1 hour. Take the fudge from the pan and slice it in half, then cut each half into 8 thin rectangles, about 1x4 inches long. Dust your hands with cocoa powder, then roll the rectangles between your palms to round them out and make them a cylinder shape. Place the cylinders on a baking sheet lined with waxed paper or parchment, and if they have softened during the rolling process, refrigerate until firm. Place the red candy coating in a microwave-safe bowl and microwave in 30-second increments, stirring after every 30 seconds to prevent overheating. Stir until melted and smooth. Take a toothpick, and poke a hole in the top of each cylinder, wiggling the toothpick a bit to widen the hole. This is where the licorice will go later, so make it large enough for the licorice string to fit in. Snip the licorice into 16 small pieces, each about an inch long. Use dipping tools or a fork to dip a piece of fudge in the red coating. Let the excess drip back into the bowl, then place it back on the baking sheet. Stick a piece of licorice into the top of the fudge where you made the hole. Repeat until all of the fudge is dipped in red and has a licorice wick. Refrigerate the tray to set the coating completely, for about 20 minutes. Chocolate Firecrackers can be stored in an airtight container in the refrigerator for up to two weeks. For the best taste and texture, serve them at room temperature.